Gianni Meersman (Etixx-QuickStep) again proved that the tricky finale of the traditional first stage of the Volta ao Algarve suits him down to the ground when the Belgian took his second win in Albufeira. 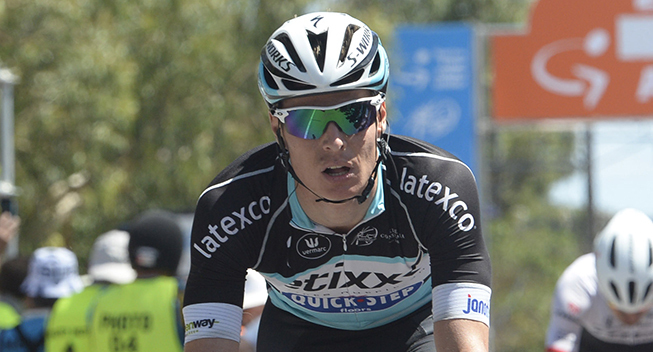 The Belgian benefited from perfect Etixx-QuickStep teamwork to beat Ben Swift (Sky) and Paul Martens (Belkin) in a bunch sprint and so became the first leader of the 5-day race. In 2012 Gianni Meersman got his season off to a great start when he won the first stage of the Volta ao Algarve. Riding for Lotto Belisol, he beat Greg Van Avermaet and Matti Breschel in the tricky final in Albufeira that traditionally opens the big Portuguese race. The final few kilometres include a short climb and several roundabouts, meaning that it is more suited to the punchy classics rides than the pure sprinters. This suits the powerful Belgian perfectly and so he had made it a big target when he lined up for the 2015 edition of the race. Fresh off from a win in the Cadel Evans Great Ocean Road Race, Meersman got lots of confidence from his Etixx-QuickStep teammates who combined forces with Lotto Soudal to reel in the early break. In the end, they managed to position their sprinter perfectly and he managed to hold off Ben Swift and Paul Martens to take his second win in Albufeira. For Lotto Soudal, the stage ended as a big disappointment. With Greipel on the roster, they had the big-name sprinter in their line-up and they work hard all day to set their fast German up for the win. However, he struggled in the tricky finale and had to be content with 13th, meaning that he is still without a win in 2015. With the win Meersman also takes the overall lead and he now leads Swift by four seconds. He will wear the yellow jersey in tomorrow’s second stage which will see a change of guard. After a flat start, the tough stage includes a difficult 4.5km climb with an average gradient of 7.8km in the finale and after the summit, only 5.4km of fast descent remain. Last year Meersman’s teammate Michal Kwiatkowski took a solo win in the same finale and the stage will be the scene of the first big GC battle in the race. The 41st Volta ao Algarve kicked off with a 166.7km stage from Lagos to Albufeira that was mostly flat. There were a few smaller climbs at the midpoint, including one categorized ascent, before the riders descended back to a flat finish along the coast. However, the finale in Albufeira was known as a tricky one with its small climb and many roundabouts close to the finish, meaning that it has often been possible to surprise the sprinters. The riders took the start under a sunny sky but with a sprint finish widely expected, there was no big action from the start. Very early Mario Gonzalez (ActiveJet), Joni Brandao (Efapel), John Benta (Louletano) and Samuel Magahaes (Radio Popular) attacked an after 6km of racing, they were already 50 seconds ahead. The peloton took it very easy, meaning that the gap was 3.50 at the 10km mark and it even reached 7.20 19km later. Brandao beat Gonzalez, Magalhaes and Benta in the first intermediate sprint at a point when the gap reached its maximum of 7.35. The peloton now started to chase and after 46.5km of racing, the gap had been brought down to 6.35. At the 63km mark, it was just 5.00 and after 88km of racing, it was 3.52. In the peloton, it was the Murias Taldea team who joined forces with Etixx-QuickStep and Lotto Soudal to set the pace, the Spanish team hoping to catch the break before the KOM sprint. At the 95km mark, they had brought the gap down to 3.52 and as they hit the climb it was 2.58. Benta was unable to keep up with his fellow escapees and as he dropped back to the bunch, the chase had kicked off in earnest. At the 138km mark, the gap was only 1.45 and when Gonzalez beat Brandao and Magalhaes in the final intermediate sprint, the escapees were only 50 seconds ahead. After 150.5km of racing, the break was caught as Etixx-QuickStepe and Lotto Soudal continued their fast pace. They kept the speed high all the way to the finish where Meersman paid back his teammates for the confidence by taking a sprint win.